Hiya guys! It's another day in Digit-al Dozen week, which this month is paying homage to our Nail Heroes. This week is all about paying love to our favorite nail artists, bloggers, nail tools, polish, etc. Since the announcement of this theme I knew I wanted to dedicate a day to my best friend Cheyenne of CDBNails. We've been friends for almost three years now and although we have never met in person, she's one of the closest people in my life. I can count on her for everything and anything. Not only is she a great friend, but she's an incredible nail artist. So for today's prompt I tried to recreate one of her Nightmare Before Christmas designs. I know it's her favorite movie of all time, so no pressure eh? When someone is as good as Cheyenne is doing freehand art, she makes things look simple and easy. I really wish I could of done one of her Nightmare Before Christmas designs any justice, but she's just so incredibly talented. 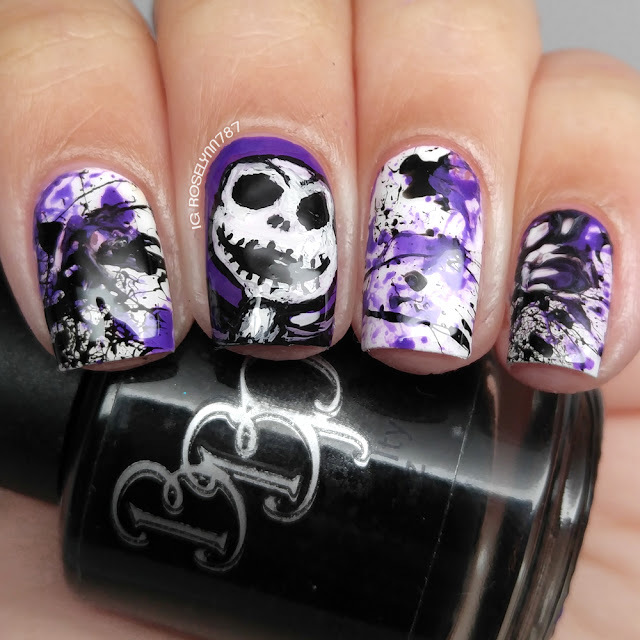 She will never cease to awe me with her nail art! But nevertheless, I love how this turned out! 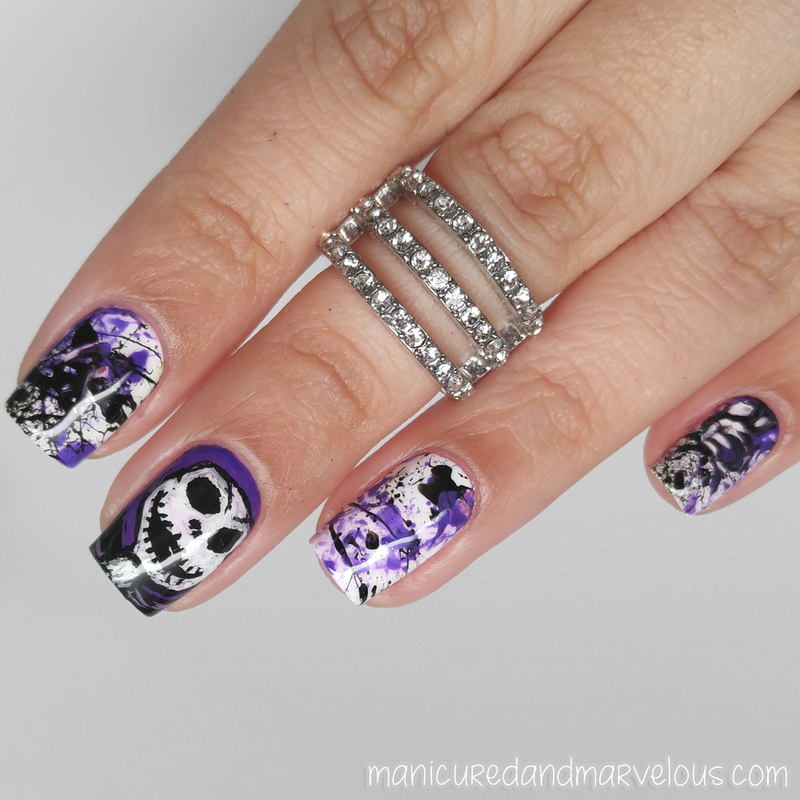 The splatter part of this mani was done very quickly since I only worked using two colors. Granted I think I did it a little too fast because at one point I inhaled the paint through the straw. That wasn't good guys, it wasn't good at all. Coughing fit aside, the splatter was done in less than a half hour. Got to love easy techniques like this! Because I did a similar look last month, I didn't do another video this time around. If you'd like to see the video then it's actually up on my YouTube channel, just click here. 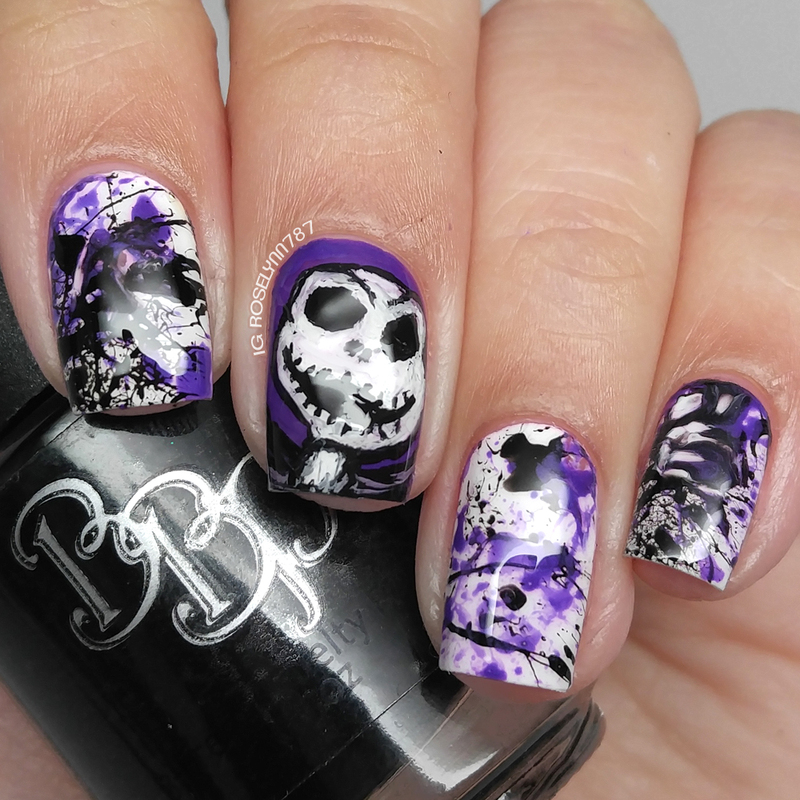 The Jack Skellington accent nail definitely took a little longer... about two hours longer. I'm sorry guys I couldn't film the whole process or any of the process really. Detail art is not an easy thing to film, but I am hoping with some practice I'll be able to do it one day. Practice makes perfect after all. And we are a little over half way there! I really hope you like this design as much as I did. Especially you Cheyenne, cause I know you'll be reading this. Love you always buttface haha. Don't forget to check out the other talented ladies from the Digit-al Dozen and their nail art during Nail Heroes week. I love you too buttface! And I love the mani too!!!! These look amazing! You did a great job with the freehand, and I love how the splatter turned out! Both of you are so talented! That's my fear with doing splatter manis...accidentally inhaling the polish! Lol. Glad that you're okay though!